What do some of the street names mean? The suburb of Khandallah got its name from the homestead which was built on the corner of Burma Rd and Kim St on land that belonged to James Boddington. The homestead was called Khandallah. 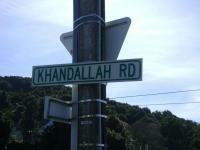 The word Khandallah means ‘hills and valleys’, or ‘home of the god’ or ‘resting place of god’. An Indian army officer named the area Khandallah. Probably Captain Edward Battersbee might have done it because of his military station in India. Also Captain James Andrew lived at the homestead and some information says he named the area. He definitely named Khandallah Station as he gave some of his land for the Khandallah railway station to be built when they built the Wellington to Manawatu Railway in about 1894. Khandallah became a farming community in the 1840s and provided milk and produce for Wellington city. Some of the earlier farmers were John Casey and James Nairn. Nairnville Park was named after James Nairn because his farm was there. Khandallah was part of the Onslow Borough which became part of Wellington in 1919. Then in the mid 1920s many street names were changed to Indian names to reflect the name of the suburb. Before this they had names after the houses or families in the streets.